Greater Cleveland is a nickname for the metropolitan area surrounding Cleveland, Ohio and is part of what used to be the Connecticut Western Reserve. 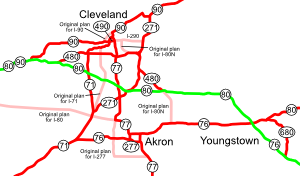 Northeast Ohio refers to a similar but substantially larger area as described below. This article covers the area generally considered to be Greater Cleveland, but includes information on the entire region of Northeast Ohio which includes the cities of Cleveland, Akron, Canton, Elyria, Lorain, Warren, and Youngstown. According to the 2010 Census, the five-county Cleveland-Elyria-Mentor Metropolitan Statistical Area (MSA) consists of Cuyahoga County, Geauga County, Lake County, Lorain County, and Medina County, and has a population of 2,077,240. Greater Cleveland is the largest metropolitan area in Ohio. The larger Cleveland-Akron-Elyria Combined Statistical Area is the 14th-largest Combined Statistical Area in the United States, and includes the above counties plus Ashtabula County, Portage County and Summit County, with a population of 2,881,937. The Cleveland-Akron-Canton television Designated Market Area covers this area, and all of Northeast Ohio except for the Youngstown/Warren region. It is the 16th largest in the United States, according to Nielsen Media Research. However, the areas commonly understood as Greater Cleveland or Northeast Ohio are not precisely defined. Most often, Greater Cleveland is understood as referring to all of Cuyahoga County, and a number of surrounding communities. The Cleveland-Elyria-Mentor MSA covers most of this area and some smaller outlying communities. One organization states that Northeast Ohio consists of 16 counties (Ashland, Ashtabula, Carroll, Columbiana, Cuyahoga, Geauga, Lake, Lorain, Mahoning, Medina, Portage, Richland, Stark, Summit, Trumbull and Wayne counties) and includes the cities of Cleveland, Akron, Canton, Lorain, Elyria, Medina, Ashtabula, Youngstown, and Warren. Northeast Ohio is home to approximately 4.5 million people, has a labor force of almost 2 million, and a gross regional product of more than US$134 billion. Additional counties are often (but not always) considered to be in Northeast Ohio. These locations include Erie, Holmes, Huron and Tuscarawas counties, thus making the total population of the entire northeastern section of Ohio well over 5 million people. The areas commonly referred to as Greater Cleveland or Northeast Ohio are not precisely the same as either the Cleveland-Elyria-Mentor MSA or the Cleveland-Akron-Elyria Combined Statistical Area defined by the U.S. Census Bureau. Some geographers describe the area stretching from Cleveland to Pittsburgh as the "Steel City Corridor", encompassing the cities of Akron, Canton, and Youngstown. In the 1950s, AT&T assigned Northeast Ohio the 216 area code, and in 1996, Northeast Ohio was divided into two area codes. Area code 216 was reduced in size to cover the northern half of its prior area, centering on Cleveland and its lake shore suburbs. Area code 330 was introduced for remaining outlying areas formerly covered by area code 216, including Akron, Brunswick, Canton, Medina, Warren and Youngstown. In 1997, area code 216 was further split as the need for additional phone numbers grew. Area code 216 was again reduced in geographical area to cover the city of Cleveland and its inner ring suburbs. Area code 440 was introduced to cover the remainder of was what previously area code 216, including the communities of Mentor, Elyria, Painesville, North Ridgeville, Strongsville, Brecksville, Lorain, and other Greater Cleveland communities. Some communities, such as Parma, and Parma Heights were divided into multiple area codes. In 1999, Congressman Dennis Kucinich introduced federal legislation to protect small and medium-sized cities from being split into two or more area codes. In 2000, it was anticipated that the available phone numbers in area code 330 would be exhausted, and an overlay area code was introduced. Area code 234 was assigned to overlap existing area code 330. With the creation of area code 234, any new phone number in the geographical area formerly covered by area code 330 could be assigned a phone number in either the 234 or 330 area codes, with no change in local or long distance toll status. This made necessary the use of ten-digit dialing within the 330/234 area code region. After the introduction of area code 234, assignments of new telephone numbers in the area did not continue at an accelerated pace, and new phone numbers for area code 234 were not assigned until 2003. The Council of Smaller Enterprises coordinates and advocates for small businesses in the region. Many of the area's sustainability-oriented companies are tied into the network Entrepreneurs for Sustainability. I-271 and I-480 are the only two three-digit interstates in the nation to be concurrent, near Bedford Heights in Cuyahoga County. The Greater Cleveland Regional Transit Authority operates a bus system and heavy and light rail in Cuyahoga County. Other transit agencies serve the surrounding counties and provide connections with RTA, including Laketran in Lake County, Metro in Summit County, PARTA in Portage County, SARTA in Stark County, and Lorain County Transit in Lorain County. In addition to Playhouse Square Center, the second largest theater district in the United States, Greater Cleveland has a vibrant theater community throughout the region. Cleveland's professional sports teams include the Cleveland Indians (Major League Baseball), Cleveland Browns (National Football League), and Cleveland Cavaliers (National Basketball Association). The Indians have two minor league affiliates in the area, the AA Akron Aeros and the Single-A Lake County Captains, who play in Eastlake. Additionally, there is an independent baseball team, the Lake Erie Crushers, in Avon. Minor league hockey is represented in the area by the Lake Erie Monsters of the American Hockey League. They began play in the 2007–08 AHL season at the Quicken Loans Arena. The team is the minor league affiliate of the Colorado Avalanche of the NHL. Motorsports venues in the region include Mid-Ohio Sports Car Course in Lexington and Summit Motorsports Park in Norwalk, a major NHRA venue. The Cleveland Metroparks are a system of nature preserves that encircle the city, and the Cuyahoga Valley National Park encompasses the Cuyahoga River valley between Cleveland and Akron. The region is home to Mentor Headlands Beach, the longest natural beach on the Great Lakes. ^ Cleveland Plus: Northeast Ohio Counties. Retrieved September 20, 2010. ^ "Congressman Dennis Kucinich". Kucinich.house.gov. http://kucinich.house.gov/Issues/Issue/?IssueID=1571. Retrieved 2010-08-01. ^ Lin-Fisher, Betty (October 31, 2003). "CALL FOR MORE TELEPHONE NUMBERS ANSWERED - 234 AREA CODE CONNECTED MOST PEOPLE ARE STILL BEING ASSIGNED 330 NUMBERS". Akron Beacon Journal (Knight Ridder): p. D1. http://infoweb.newsbank.com/iw-search/we/InfoWeb?p_product=NewsBank&p_theme=aggregated5&p_action=doc&p_docid=0FE8E517C5F41E33&p_docnum=1&p_queryname=2. ^ Colleen Mulcahy, "Benefits administrator blasts health mandates. (John Polk)", National Underwriter Property & Casualty-Risk & Benefits Management, Oct. 14, 1991. ^ Shannon Mortland, "COSE to help push ideas for reforming health care. (Health Care)(Council of Smaller Enterprises)(Brief Article)", Crain's Cleveland Business, Aug. 8, 2005. ^ "GROWING GREENER GOOD FOR BUSINESS GROUP HOPING TO FIND NEW WAYS TO TURN WASTE MATERIAL INTO PROFIT", Akron Beacon Journal (OH), May 5, 2008. ^ "Making Change: Sustainable Businesses", 90.3 WCPN ideastream, Wednesday, May 28, 2003. ^ "Actors' Summit - A Professional Theater Located in Hudson, Ohio". Actorssummit.org. 2010-05-07. http://actorssummit.org/. Retrieved 2010-08-01. ^ "destinationdowntownakron.com". destinationdowntownakron.com. http://web.archive.org/web/20070208125343/www.akroncivic.com/. Retrieved 2010-08-01. ^ "Virtual Akron- Highland Theater". 2002. http://www.virtualakron.com/highlandtheater/. Retrieved 2010-09-15. ^ "Beck Center for the Arts". Lkwdpl.org. 2010-01-03. http://www.lkwdpl.org/beck/. Retrieved 2010-08-01. ^ "Something Dada Improvisational Comedy". Cabaretdada.com. http://www.cabaretdada.com/. Retrieved 2010-08-01. ^ "Cleveland Play House". Cleveland Play House. http://www.clevelandplayhouse.com/. Retrieved 2010-08-01. ^ Pavlish Group: Jason Maxwell / Don Pavlish. "Cleveland Public Theatre ~ Home". Cptonline.org. http://www.cptonline.org/. Retrieved 2010-08-01. ^ "Dobama Theatre - Cleveland's Contemporary Stage". Dobama.org. 2010-06-05. http://www.dobama.org/. Retrieved 2010-08-01. ^ "Bay Village, Ohio". Huntington Playhouse. 2010-07-14. http://www.huntingtonplayhouse.com/. Retrieved 2010-08-01. ^ "Near West Theatre". Near West Theatre. http://nearwesttheatre.org/. Retrieved 2010-08-01. ^ Rick Evans. "Olde Towne Hall Theatre". Olde Towne Hall Theatre. http://www.oldetownehalltheatre.com/. Retrieved 2010-08-01. ^ Canton Palace Theatre (2003-07-30). "Canton Palace Theatre". Canton Palace Theatre. http://www.cantonpalacetheatre.org/. Retrieved 2010-08-01. ^ "Home". PlayhouseSquare. http://www.playhousesquare.com/. Retrieved 2010-08-01. ^ "Bodwin Theatre Company". Bodwin_theatre.tripod.com. http://bodwin_theatre.tripod.com/. Retrieved 2010-08-01. ^ "Carousel Current Shows". Carouseldinnertheatre.com. http://carouseldinnertheatre.com/. Retrieved 2010-08-01. ^ "Charenton Theater Company". Charenton.org. http://www.charenton.org/. Retrieved 2010-08-01. ^ "Cleveland Shakespeare Festival". Cleveshakes.org. http://www.cleveshakes.org/. Retrieved 2010-08-01. ^ "Convergence Continuum". Convergence Continuum. http://www.convergence-continuum.org/. Retrieved 2010-08-01. ^ "Fairmount Center for the Arts". Fairmountcenter.org. http://www.fairmountcenter.org/. Retrieved 2010-08-01. ^ "INDEX". Fourthwallproductions.com. http://www.fourthwallproductions.com. Retrieved 2010-08-01. ^ "Great Lakes Theater Festival". Greatlakestheater.org. http://www.greatlakestheater.org/. Retrieved 2010-08-01. ^ "The Public Squares". The Public Squares. http://thepublicsquares.com/. Retrieved 2010-08-01. This page uses content from the English language Wikipedia. The original content was at Greater Cleveland. The list of authors can be seen in the page history. As with this Familypedia wiki, the content of Wikipedia is available under the Creative Commons License.